Emaar Properties, the developer of the iconic Burj Khalifa will be marking Ramadan with two captivating shows that will capture the glazier effects from synchronized music, in a rare symphony of melody and design. Selected from hundreds of submissions, the first show celebrates the spiritual value of Ramadan with an inspiring display of a prolific designer/painter Art Noor’s pathbreaking work, a painting inspired by the 99 names of Allah, said a statement from Emaar. Completed over 15 years, this masterpiece work has been exhibited in several high-profile locations. 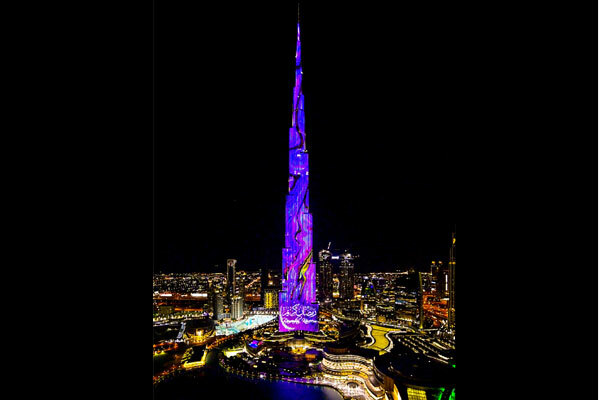 The work can now be watched on the imposing canvas of Burj Khalifa, it stated. Also to be displayed is a design by Freelusion, an agency based in Budapest, Hungary, which specialises in impressive projections on buildings and 3D content. Emaar said the show, which captures the glazier effects from the synchronized music, in a rare symphony of melody and design, will be held from Sunday to Wednesday, every hour between 7.15pm and 10.15pm and Thursday to Saturday every 30 minutes from 7.15pm to 10.45pm.